Applying machine learning to analyze data from design and test flows has received growing interests in recent years. In some applications, data can be limited and the core of analytics becomes a feature search problem. 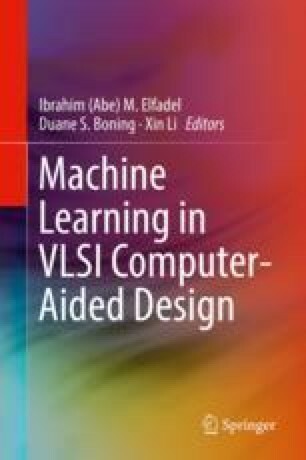 In this context, the chapter explains the challenges for adopting a traditional machine learning problem formulation view. An adjusted machine learning view is suggested where learning from limited data is treated as an iterative feature search process. The theoretical and practical considerations for implementing such a search process are discussed. This work is supported in part by National Science Foundation under grant No. 1618118 and in part by Semiconductor Research Corporation with project 2016-CT-2706. The author would also like to thank his doctoral student Kuo-Kai Hsieh especially for his help on Sects. 13.6.4 and 13.6.5. This chapter is an extension from author’s prior work “Machine Learning for Feature-Based Analytics,” in Proceeding 2018 International Symposium on Physical Design, pp. 74-81 Ⓒ2018 Association for Computing Machinery, Inc. http://doi.acm.org/10.1145/3177540.3177555. Reprinted by permission.